Twice during the last decade of his life, in 1934 and 1936, F. Scott Fitzgerald proposed a collection of his personal essays to Maxwell Perkins, his editor at Charles Scribner's Sons. Perkins was unenthusiastic on both occasions, and Fitzgerald died in 1940 without having put his best essays between hard covers. Fortunately Fitzgerald left behind a table of contents, and with this list as a guide it has been possible to publish here the collection that he envisioned, under the title My Lost City. This volume also includes several of Fitzgerald's autobiographical writings. 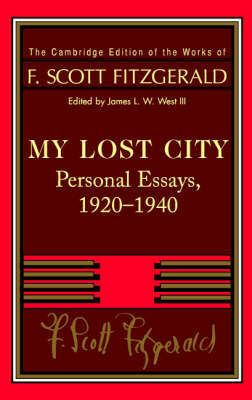 My Lost City, like the other volumes in the Cambridge Edition, provides accurate texts based on Fitzgerald's surviving manuscripts and typescripts. Words and passages cut by magazine editors have been restored to several of the essays. A textual apparatus has been included, along with full explanatory notes identifying people, places, books, historical events, and other details.